Believe it or not back in 2003 there were Orlando locals who would spend every weekend hanging out at Pleasure Island. The most infamous of these "Islanders" (a term I just created) was a dude named Joe. Joe was probably in his mid forties, and dressed like a dude from the mid eighties. Actually that isn't entirely true, most of the time he wore black jeans and a cut off black t-shirt. I can't blame him for the cut offs though, he had to show off the Superman symbol tattoo on his upper shoulder that read "Bon Jovi Forever" (that is 100% true). Joe had a good number of tattoos, off the top of my head I remember him having Freddie and Jason on his forearm. 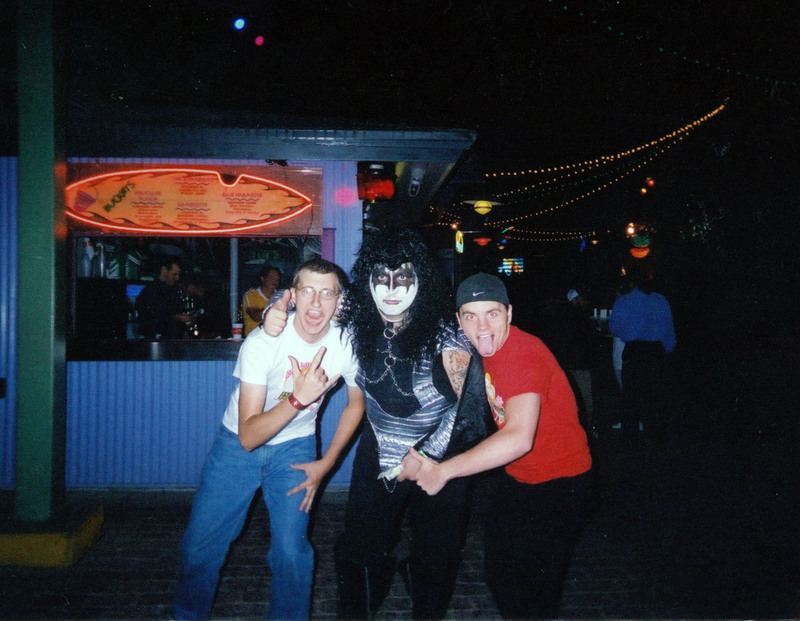 He also had Cartman from South Park, and of course, every member of KISS. Before I forget to mention it, and you probably would have assumed anyway, Joe had a glorious mullet. Dan and I gave Joe the nickname Road Dog because (legend had it) he was the roadie for a bunch of 80's metal bands. We never called him Road Dog to his face though, because Joe was a total jerk. I think he still felt he was back in the 80's making demands for the lead singer of RATT. When Joe would come into The Missing Link, he wouldn't walk down towards the register like all the other guests, he would stop right inside the door behind the grill. He would bark his order "2 chili cheese hot dogs, chili cheese fries." Joe never went to the register because he had no intention of paying for his food. I guess sometime in the past he had been given a free meal and had expected one ever since. This was the only conversation you could really get out of him. While his food was being prepared Dan and I would try to talk to him but he usually gave us quick one word answers. We eventually started putting on a real fan fare when he came in which he seemed to enjoy, but didn't get us any closer to the Road Dog. Our relationship felt like we were trying to befriend the school bully who was stealing our lunch money by laughing about it with him. 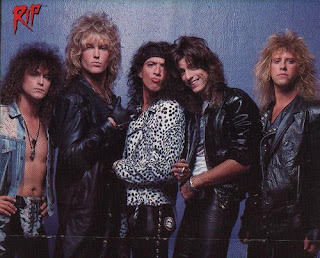 If there was on thing that you could say about Joe, it was that he loved KISS. I already mentioned the tattoo, but he also had a black corvette with the members of KISS airbrushed on the hood. He would park it front and center in the Pleasure Island parking lot, not even in a space. One night KISS played a show in Tampa, Joe had told Dan and I that he was going in full make up and that after the show he was driving back to Pleasure Island to show it off. We had the night off but Dan and I made a special trip to PI to see Joe all painted up. He made the 2 hour drive back from Tampa in his KISS make up and showed up just in time to be the person selected to do the nightly Pleasure Island New Years countdown. The DJ played a KISS song and he rocked out on stage feeding off the energy of the crowd like one of the bands he had roadied for so many years before. After the fireworks Joe just walked around PI in his KISS costume, Dan and I went up to him and asked for a photo. This was the happiest I had ever seen him, I'm pretty sure we even called him Road Dog when we saw him. It has been almost 10 years since I have seen the Road Dog, but I still have fond memories of his rudeness. Who knows where he has been hanging out since Pleasure Island is no more. Maybe he's a "City Walker" now. If you are ever in Orlando and see a KISS corvette illegally parked, just know that the Road Dog is near (and some poor employee is getting the brunt of his wrath). Hell hath no fury like a Road Dog scorned. ha ha i worked at Virgin in 2003 and i don't think I remember ever seeing this character. I worked at Virgin from 98 to 01, and this guy was in there often. We never knew he had a name, though. He was always nice to me...I remember how happy he was the night that Galaxy Quest came out on dvd. He just kept smiling and telling me that he likes satire and then smiling at the dvd, and then me again, and then telling me that he likes satire (repeated all steps 3 or 4 times). That's the thing...I think he just doesn't have a whole lot of words to use, so don't feel slighted. I never got to hear him say "chili". I'm impressed. The DJ would often put on a Kiss song when he came in, and he would then want to hug someone. Most of us knew him as Kiss Guy Joe. He hung out at the Rock n Roll beach club quite a bit. Honestly Joe and I would talk a lot out in front of RRBC about horror movies. as a matter of fact the night Freddy vs Jason came out he grabbed me a copy. I wonder if he has seen your blog? It would probably blow his mind.